Mobile guard reporting app technologies are not all the same. While most can now claim the same basic buzz words, like real-time, mobile, automatic, daily activities, checkpoint scanning & Incident Reports, very few mobile guard tour and patrol reporting apps can offer the breadth of reports that GuardMetrics can. These mobile reports include Activity Reports, Incident Reports, Scan Reports, Visitor Reports, Site Inspection Reports, Disciplinary Reports, Vehicle Inspection reports, K-9 Reports, Chain of Custody Reports, Ban from Property Reports, and much more. GuardMetrics is also one of the very few mobile guard reporting systems whose description can also include terms like simple, user-friendly, easy to deploy and affordable! There are a number of reasons for this, but the long and short of it is that The GuardMetrics security guard reporting app was developed, right here in America, by personnel who spent decades in the security guard industry. We are very familiar with the landscape and the margins involved in running a successful security officer business. 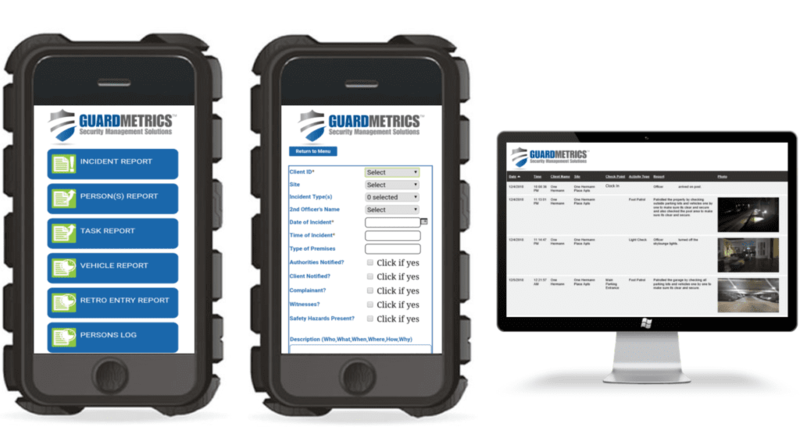 Call us today and see why the GuardMetrics mobile guard reporting app could be the best guard app for you! And what about getting the reports to your clients? 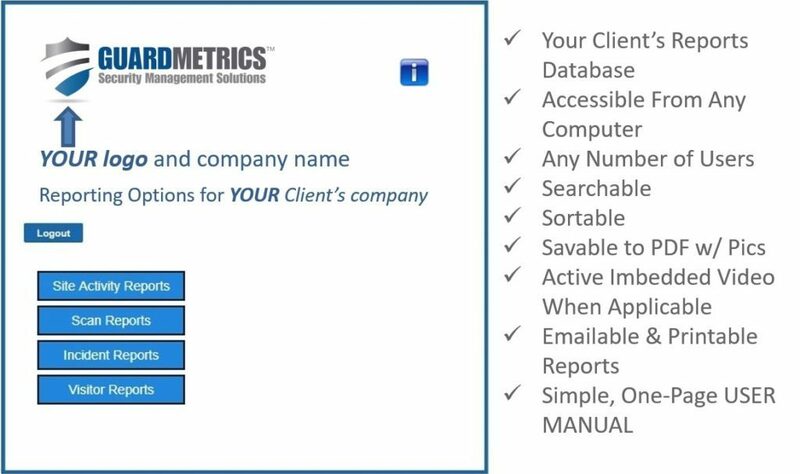 This is where GuardMetrics can truly help you streamline operations, help you retain clients, and simplify your life! GuardMetrics has developed a very simple method to create reports, including pics and videos and timestamps (using the mobile guard reporting app). These mobile reports then go into the “Management Portal” in real-time, where you or your administrative staff can edit and approve the reports with a couple clicks. Once approved, the reports immediately feed into the “Client Portal” that you have set up for your client (also incredibly simple to do)! Call us, or click here, to see why this mobile guard reporting app & the “Client Portal” are your winning combination! If you currently email reports to your clients, they must first sift through email to find the reports, then move them to different email folders and/ or save them to PDF to save somewhere on their computer, email them to whoever else is supposed to see them to do the same, and all while having no easy way to search the data later if they need to look at a report from the past. With the GuardMetrics mobile guard reporting app, your clients will have their very own “Client Portal”—branded with your logo, company name and their company name on top—where all of their reports are professionally stored. Your client can now login and view and/or print any reports they wish! All of the reports are searchable and filterable, to view specific dates, incidents, etc., contain any pics and video attached, and are accessible from any computer! And for YOU, the reporting process is very simple, and just one more reason that your client has to stay with you. First there were hand delivered reports with paper-clipped photos, then there was snail-mail, then there was email. Now there is the GuardMetrics Client Portal, made possible with the mobile security officer reporting app. Call now to simplify your operations with the GuardMetrics mobile guard reporting app and Client Portal.